There’s little to disappoint at any Kero Kero Bonito show. 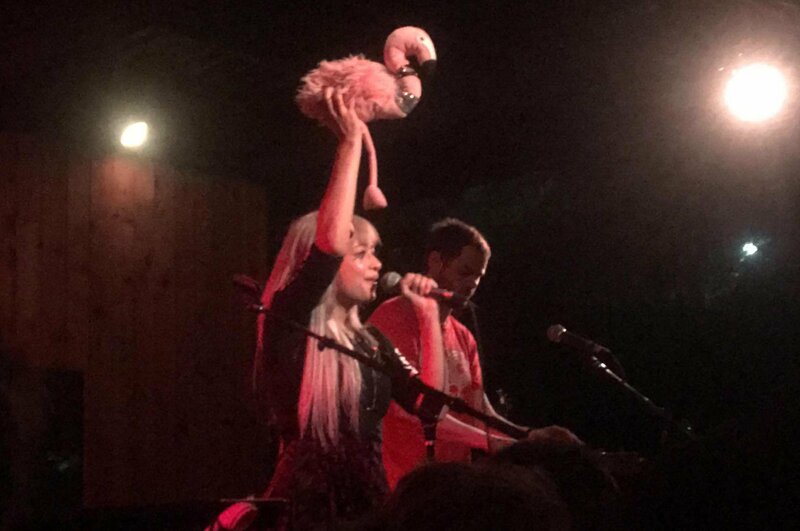 In recognizable KKB fashion, Barracuda’s outback stage was scoured with notable props (Sarah’s flamingo, strapped up telephone, and adorable crocodile plush) last Friday, October 26th. After having seen them at Sound in Sound fest back in 2016, I had high hopes for this set. Just like before, KKB came at the crowd in full swing. The set began with their hit single "Flamingo" which involves Sarah, the lead singer, propping her plush flamingo around the stage, dancing with it like she’s in the shower, or simply holding it high into the sky as an offering to the kawaii gods. The crowd which mostly consisted of under-21 youth as well as some babyfaced 21+ folks, like myself, were utterly enthralled. Despite "Flamingo" and many other KKB songs having some Japanese lyrics, it’s truly astounding how many fans of various ethnic backgrounds can scream them back at Sarah and the ole band. The most notable difference between that SOS fest performance and this one at Barracuda was the addition of two band members, and in turn a more varied instrumentation. Formerly, KKB seemed to only come equipped with a drum kit, some synths and computers, and Sarah’s dazzling presence. But now, KKB brought along a bassist and guitarist. This added so much width to into their sound by infusing these instruments into even songs that don’t originally utilize this instrumentation such as "Flamingo." This is in part due to their most recent release - Time N’ Place - which takes a step forward in this direction. This is absolutely bonkers when you think about it. You could have Sarah singing in her high pitched timbre about good times on a starry night compounded with dazzling synth lines, when suddenly a bangin’ guitar solo breaks down the door. That constant change up really took their performances to another level in my opinion. Variation is the key to musical attention. This novel instrumentation I think is best embodied in the track "Time Today" off their latest record. The performance of this track gave me the goosebumps or what’s known as musical frisson, and I make note whenever I feel musical frisson because it’s absolutely intoxicating. This is already a distinct tune within KKB’s canon because it’s set in a minor key- a drastic contrast from the sea of major tunes in their arsenal. The lyrical ideas of time passing while KKB quite literally sits idly by at a slow song tempo is pretty ingenious. This song plays on themes of declining mental illness, but navigates it with hopeful optimism. And it’s interesting to see this side of KKB’s musical identity. This was the tearjerker track if any. The instrumentation plays it’s part by surgically putting a guitar solo into the live performance, which gives the tune a kind of catharsis. You can only stand and hold your own hand when you’re wallowing with Sarah, but the guitar solo does a phenomenal job of lightening the mood in a tasteful and expressive way - usually by repeating the main musical theme and by sprinkling some extra tidbits in too. Just like with an innocent child whose energy KKB seem to channel so well, it’s great to see how much they grow each time around. KKB not only kept their sound consistently on brand, but also managed to tweak small intricacies about they way they set the mood for larger audiences that other smaller bands may ignore. There's so much good in a concentrated and fixated point. KKB’s hit single "Trampoline" was their resounding encore track, no surprise, ending the set with a cheery climax. Unlike being the synth pop banger on Bonito Generation (and the track during which a man in a yellow raincoat penguin bellyslid to in the mud at SOS fest), this version was drastically different. You see, they metal-fied this track. Sarah screamed. She yelled. There was heavy guitar riffs. It ended in a flurry of noise. God, it was wild. Sarah even morphed her voice in the opposite direction - a low, almost burping sound. It was absolute madness and a perfect conclusion to the world’s most playful set on that night. From an infantile idea birthed during SXSW to an eye-catching sold-out show full of innocent jubilee, Kero Kero Bonito knows every right move to pry into your heart.